During the first decade of the 20th century the Detroit theater scene was centered on Monroe Ave. Small vaudeville theaters such as the National provided the stage and film needs for a growing population. But John Kunsky had other ideas. Kunsky dreamed of building larger and grander movie palaces for the showing of the new moving pictures. The area in which he wished to build these new palaces was the up and coming part of town, Grand Circus Park. Kunsky hired architect C. Howard Crane to design his first such theater, the Madison. 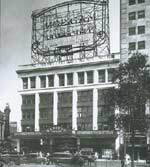 The Madison was the first large movie theater in Detroit, the first theater built on Grand Circus Park, and the first theater built by the team of Kunsky and Crane. With a budget of $500,000 Crane created a 1806 seat classical revival theater. Among the features was a tiered orchestra pit and a 'pretentious' 60,000 watt lighting system. Patrons would enter the auditorium through a rectangular entrance lobby and then through a two level main lobby. The main lobby was a long narrow space with exits on both ends. Its distinguishing feature was its oval mezzanine. The Madison's design predates the 'movie palace' layout of the 1920's. However, it was still notable and effective. In the start of a Detroit tradition, the theater was part of an office block development. At that date it was not certain if movies would be a passing fade of if such large theaters could be profitable. As an insurance policy a 5 story office building was built around the theater. The facade of the Madison Building was covered in terra cotta with classical designs. It resembled a typical office block. The only hint of the presence of a theater was the marquee. In 1961 the office block's classical design was destroyed by a modern facelift. The Madison enjoyed success. The most tangible evidence of this success was the entire district of ever larger and more lavish theaters Kunsky and Crane built around the park. By 1929 the Madison was joined by the Adams, Oriental, Capitol, Wilson, State, Fox, and United Artists theaters. For years the Madison remained one of Detroit's premiere theaters. However, by the 70's and 80's downtown theaters nation over began to struggle. Urban sprawl, suburban multiplexes, and television all began to eat away at the massive theater's profits. The Madison survived by offering a diet of rock concerts and action movies. But the business these generated would not be sufficient to keep the theater afloat. In 1984, while showing the film 'The Dead Zone' the Madison closed for good. As an ironic sick joke, the words "The Dead Zone" remained on the marquee for years. 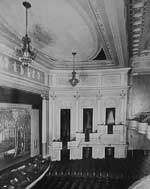 The theater was eventually bought by the Michigan Opera Theater. MOT also purchased the old Capital Theater across the street and lavished millions on it to create the Opera House. Plans called for the eventual restoration of the Madison for live stage and small productions. However, MOT could not find the money to restore the Madison. They sold the building to Lawson Reality in early 2000. Taking advantage of the nearby development of Comerica Park, Lawson planned to replace the Madison with a Post Bar with loft units. The theater was slated to demolition while the office structure would remain. Despite the theater's historic importance no cry came for its restoration. It fell to the wreckers during the summer of 2000.